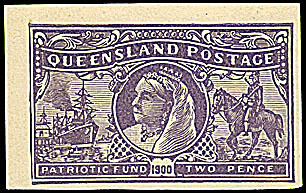 The 1900 Patriotic Fund issue of Queensland - the Die Proofs. The die proofs of the final designs are exceptionally rare. It is not known how many were printed - nor how many are still surviving. Those below are the only known die proofs. 1d and 2d single die proofs of final designs. 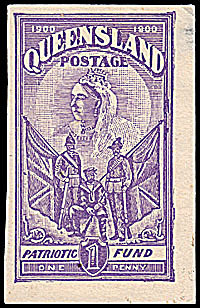 Printed in violet on thick surfaced wove paper. 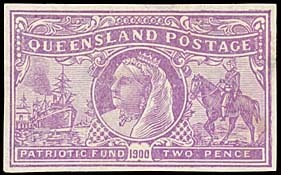 Spink October 2012 Lot 1391. These may also have been sold at Matthew Bennett February 2003 as Lot 569. 1d and 2d die proofs printed se-tenant. Printed on thick surfaced wove paper. Spink October 2012 Lot 1390. Some plate proofs may have also been printed - at least for the 2d (1/-) design. They were printed on unwatermarked paper and left ungummed and imperforate. These characteristics distinguish them from colout trials which are watermarked like the stamps. Upward point on top right corner and top right frame slightly doubled. Ink marks at right. This example may actually be a colour trial. It would need to be inspected because the Catalogue description may be wrong - as it was for the colour trial sold by Prestige and shown elsewhere. Prestige Philately December 2009 Lot 404.